Jao Camp is situated in a private reserve on a remote large island, to the west of the Moremi Game Reserve in the heart of the Okavango Delta. Across the waterway in front of the camp, guests have access to open flood plains and savannah for a wonderful Okavango experience. Guests are accommodated in nine large and spacious rooms. Each of the unique and beautiful twin-bedded canvas and thatched rooms has been individually handcrafted under the direction of renowned architects Sylvio Rech and Leslie Carstens. The rooms are built under a canopy of shady trees, with en-suite bathroom, hot and cold running water, a large bath and double vanity. There is an additional outside shower under the stars for those more adventurous guests who want to shower closer to nature. There is an outdoor "sala" for guests to enjoy midday siestas with a view and a breeze. The rooms are raised off the ground and offer wonderful views of the surrounding flood plains. A raised walkway connects the rooms to the dining room and lounge area. There is a plunge pool and an outdoor 'boma' for dining under the stars, as well as an excellent wine cellar. Jao also offers a Salon with a fulltime therapist, offering a wide range of massage treatments. The activities at Jao include mokoro (dug out canoe) excursions, boats, fishing, day and night game drives and guided walks. If the area has a large flood, they usually have to boat to a large island, called Hunda Island, where vehicles would be waiting and the game drives start. The area is extremely seasonal and the annual flood transforms the habitat from dry green open plains in summer to shallow flood plains in the winter. Access to this area is only by aircraft. 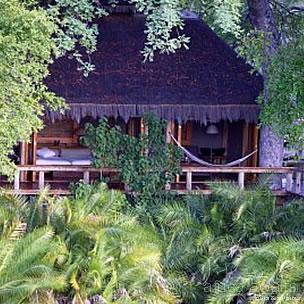 Lying as it does in the very heart of the Delta, the Jao Reserve embodies all the magic and mystique of the Okavango. Narrow water channels cut their way through the papyrus and reed beds in the permanent delta to the north and east of the reserve providing the perfect environment for the elusive sitatunga and the rare Pels fishing owl. In the central region of the reserve vast open flood plains provide some of the most stunning scenery of the region. Jao Camp lies in the southern side of the plains. The lion prides in this area have been studied for the past 5 years by the resident guide, and a good record has been built up allowing us more intimate knowledge of their behaviour. 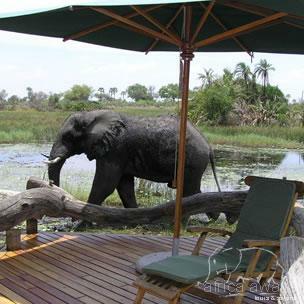 With your holiday, safari or business trip from in to Jao Camp in Botswana.